Additional pulley with quick link. The engineered design of all of our rope is to maximize strength while providing excellent flexibility and handling while being resistant to harsh outdoor environments. Our rope serves many applications and has special qualifications for use with antennas (wire or otherwise), tower and mast support, hauling, marine, banners, and signs. Other uses include shade sail support, tarping, and archers' bow string follower line. Also perfect for vertical structures such as scaffolding or tree limb control. 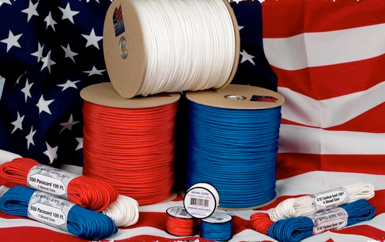 High breaking strength: Our ropes are made in USA mills and have the highest breaking strengths available in comparable diameters than our competitors. Why pay for lower strength when you can get comparable rope that is much stronger? Polyester vs. Dacron™, what is the difference? Dacron™ is a registered trademark of the DuPont corporation. Dacron™ is also double braided polyester rope (just like ours), but due to the trademarked name, it commands a higher selling price. All of our rope is also double braided polyester. When stealth matters, this is the rope for that “invisible” dipole. With breaking strength of 450 pounds, this will keep your antenna up! Price: .14/ft. Available in increments of 25 feet. Continuous lengths available up to 1200 feet; email for details at Chris at KF7P dot com. Our most popular, general purpose antenna rope. Breaking strength of 1300 pounds, almost twice that of most competitors rope! Perfect for wire antennas and guying of verticals and light masts. Getting ready for field day? This is the all around rope! Price: .19/ft. Available in increments of 25 feet. Continuous lengths available up to 1200 feet; email for details at Chris at KF7P dot com. Perfect for guying of verticals, masts, and light duty, temporary type towers, this rope boasts a breaking strength of 2600 pounds. Price: .30/ft. Available in increments of 25 feet. Continuous lengths available up to 1200 feet; email for details at Chris at KF7P dot com. Are you an aspiring tower jockey? Or just looking for a quality, made in USA rope that can handle all your tower construction products for decades to come? This double braided polyester rope is perfect for general hauling, temporary guying, tramming, and gin pole use. The 1/2” diameter is large enough to hold fast and has a nice soft sheath that is easy on your hands. Breaking strength 7050 pounds! (Yes, 7050#). Price: .52/ft. Available in increments of 50 feet. Continuous lengths available up to 1200 feet; email for details at Chris at KF7P dot com. Our 1/2” rope is great for gin pole/tower construction, and general purpose hauling! Quality: Our 550 paracord with 7 strand inner cores and that is exactly what you get, no fake polypropylene sheath or cheap filler cores. We take great pride in providing products that meet or exceed strength requirements, and all paracord is tested on state of the art digital testing equipment to guarantee strength and performance. When visibility matters, use this neon orange paracord to prevent tripping, clotheslining, and other embarrassing accidents at field day! 100 foot package. Continuous lengths available up to 1000 feet; email for details at Chris at KF7P dot com. The default standard for all tying/tarping/camping, use this black paracord for all outdoor needs. 100 foot package. Continuous lengths available up to 1000 feet; email for details at Chris at KF7P dot com. Sometimes you don’t want to be seen. OD green is great for wooded areas. 100 foot package. Continuous lengths available up to 1000 feet; email for details at Chris at KF7P dot com. Our desert tan is great for blending in to dry desert terrain and remaining stealth. 100 foot package. Continuous lengths available up to 1000 feet; email for details at Chris at KF7P dot com. In a true emergency or survival situation there isn’t time to untangle cord. TRD delivers high strength cord when you need it most and it’s built-in cutting blade eliminates the need for additional tools. Whether you need cord for camping, survival, work, around the house or on the farm, the TRD makes using cord fast and simple without the hassle of tangles. Simply pull out what you need, cut it and you’re done. The rest will be stored away until you need it again. If you run out, don't worry. It's re-loadable. Comes filled with 50 feet of black paracord.  See video above for demo. Many colors and patterns available; let me know what you are looking for. 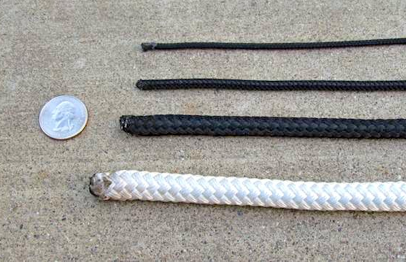 Similar to the TRD above, the mini rope dispenser comes with 125’ of black 3/64” cord (100 pound tensile strength). Whether you need cord for around the house, garage, farm or on the trail, this cord dispenser makes it easy to have on hand and ready to use. The built-in cutting blade makes cord faster and easier to use than ever before. The dispenser is preloaded with a high-tech braided cord that is incredibly strong and lightweight. Its compact design and high strength make it versatile and useful in almost any environment and application. Spool is easily reloadable with your favorite color of cord. This video shows the operation of this product. Covert camo paracord blends in with green backgrounds. 100 foot package. Continuous lengths available up to 1000 feet; email for details at Chris at KF7P dot com. When visibility matters, use this neon green paracord to prevent tripping, clotheslining, and other embarrassing accidents at field day! 100 foot package. Continuous lengths available up to 1000 feet; email for details at Chris at KF7P dot com. Micro Cord is a small high-tech braided cord that is incredibly strong and lightweight. Its compact design makes it easy and convenient to carry and have on hand when you need it. It’s versatile and useful around the house, garage or on the trail. This cord is perfect for jewelry makers and crafters, backpacks, emergency kits, bracelets, lanyards, key chains, fishing line, handle wraps, wind chimes / dream catchers, and much more! This rope comes on a small reusable plastic spool which fit in Micro Cord Dispenser above. 125’. Use this gray paracord for all outdoor needs. 100 foot package. Continuous lengths available up to 1000 feet; email for details at Chris at KF7P dot com.